After participating in chat sessions and watching “the struggle” at last night’s meeting, I would conclude that attempting to design the future of our town by identifying with other cities, domestic or European, large and small and rural and urban – at this stage – is unreasonable for most lay citizens except those with a “planning” background. A resolution for the Clark’s Market property and the gas station is not presently on the table and, if it is, then we need to know the reality that you may already be familiar with. For the foreseeable future, the Aspenalt Lodge is here to stay. “Reasonable” solutions to the issues involving the entry into Basalt from Highway 82 and the middle lane on Midland Avenue used for deliveries, are two challenges that stand out for me, that seem to escape imagination. On the other hand, defining our roadways with egress and ingress from all four directions that is encouraged to slow down as a vehicle enters the center of town because we have narrowed the roads (Old 82) and/or placed center landscaped medians or created a traffic circle at the junction of Midland and Two Rivers, is well within our abilities to perceive and even possibly afford in the short term. Further embellishing the “entry ways” with acceptable lighting and outdoor sculpture might also be within our reach. Recapturing space to facilitate traffic, particularly on Midland Avenue, could be accomplished by reverting to parallel parking and/or eliminating parking in key areas. This can only be acceptable if we commit to “replacement parking” within an easy walk to our downtown corridor. A tasteful and, perhaps, a hidden multistory garage integrated into a multi-use project on the Clark’s Market property would still allow the 6.3% of our citizens (over 65) to park a short walk from all the resources of the core. One cannot enter into Basalt from any direction today without exposure to our rivers! Every one of these roads provides “pull outs” for direct access to the water. 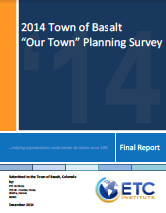 The open space now provided by the CDC/Town of Basalt property will allow any of our visitors and our own citizenry to access the riverfront in the center of our town – either through (in my opinion) visiting commercial/non-commercial businesses set up on the riverfront (i.e. : restaurants, galleries, historical museums) all of which could be integrated into the ground floor of a small boutique hotel or directly through “breezeways” designed with public access in mind. With the renovation of The Green Drake and the Frying Pan Angler fishing lodge, approximately 35 new rooms will be added to our “guest facilities. The Aspenalt Lodge will continue to attract their share of visitors, as well. The number of “upscale” rooms fronted on the river need not be near the number originally anticipated. Although I applaud the town’s willingness to open “the process” to the public at large, it seems to me that there is a great deal of work that could be accomplished – both in the planning and in the implementation – of the foundational efforts to prepare “our town” for its future. To take advantage of the unique opportunities offered to Basalt with its river project, you need to think big!! Not big in size, but big in ideas. Look, for example, at the operahaus and festspiele in Erl Tirol, Bregenz, Austria, or closer, to Santa Fe. They all transformed a small town in a very positive way. In comparison, Basalt is way ahead; it has all the ingredients to create a gourmet meal. Aspen’s pool of billionaires would compete to put their name on an international recognized operahaus and performing arts center and thus into immortality. Talented local architects can compete for the design of both the “festspiel haus” and sculpture garden with other architects in an international competition. This, in cooperation with the Julliard School of Music, there is the opportunity to find a gifted music director to head the festival. The biggest challenge remains, how to compete with God’s creation – the river!!! Build something, not against the river, but with it and thus enhance the experience of the river. On the way to the performance or on any other day one would wander along the river through a sculpture garden like the one in the Kroeller-Mueller museum in Holland. That walk, guided by the work of international and locally recognized artists would prepare one emotionally and visually for the opera or ballet or any other performance you are about to experience. The parking could be build underground at Clarks Market, with shops or ticket offices above for the festival staff. If that is to much to stomach, there is plenty of parking across Highway 82. Exotic rickshaws could take you to the festival house, driven by high school students. Because of the proximity to Aspen and its cultural events, its donors, the Julliard, the international friends of opera and music, its infrastructure, everything is in place. All Basalt has to do is dip into this existing pool and consequently offer everybody – hotels, restaurants, shops – new life with an internationally recognized performing arts center, with opera as the main drawing. 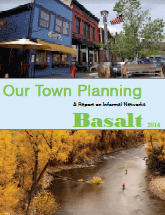 Basalt would not have to sell out to some investors or developers to put life into its economy. Aspen would come to Basalt, and not only for the occasional dinner at a local restaurant. The schools and their students in the valley would profit with an awareness of the performing arts, and studies of the arts and artist in the sculpture garden. It will enrich the quality of their lives. That alone is worth the investment. Please do not let this gift of the river project go to waste and the chance to transform Basalt into something unique for today…and for generations to come.